These wonderful scenes are interspersed around The OZ Museum. 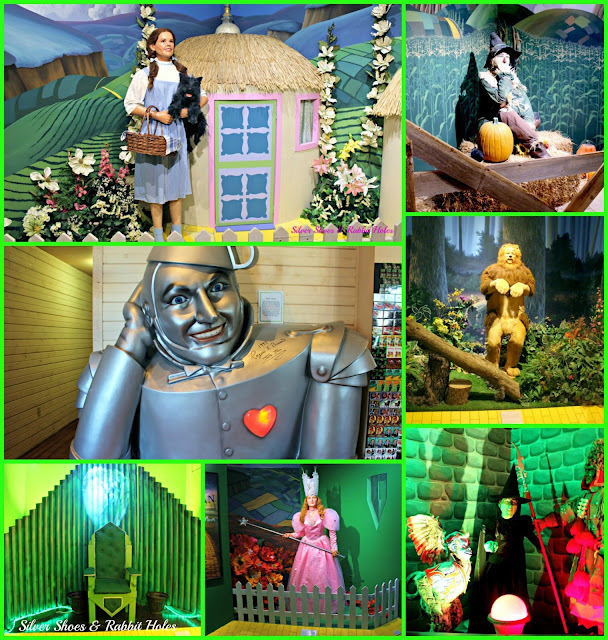 The enormous Tin Man greets you in the gift shop/lobby and is signed by Roger S. Baum. Part Two about our visit to The OZ Museum in Wamego, KS. 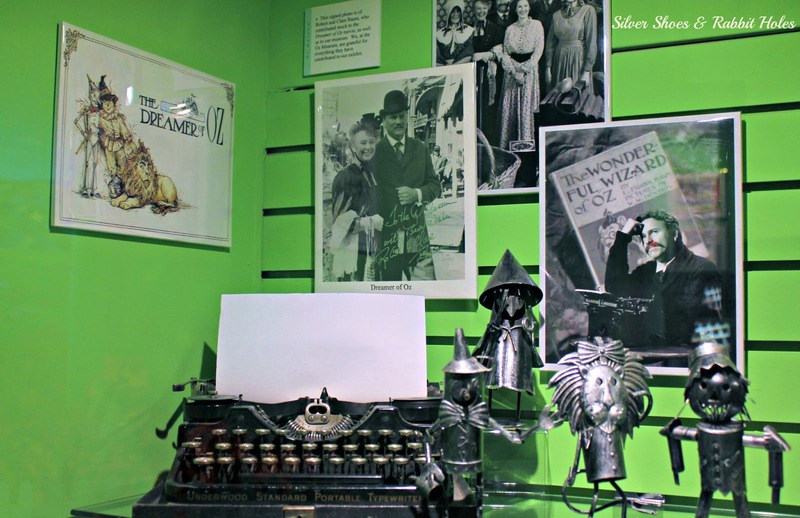 Not surprisingly, a large bulk of The OZ Museum is devoted to memorabilia from the 1939 MGM film classic, The Wizard of Oz. It starts with the life size Dorothy you see above, and continues throughout the museum. 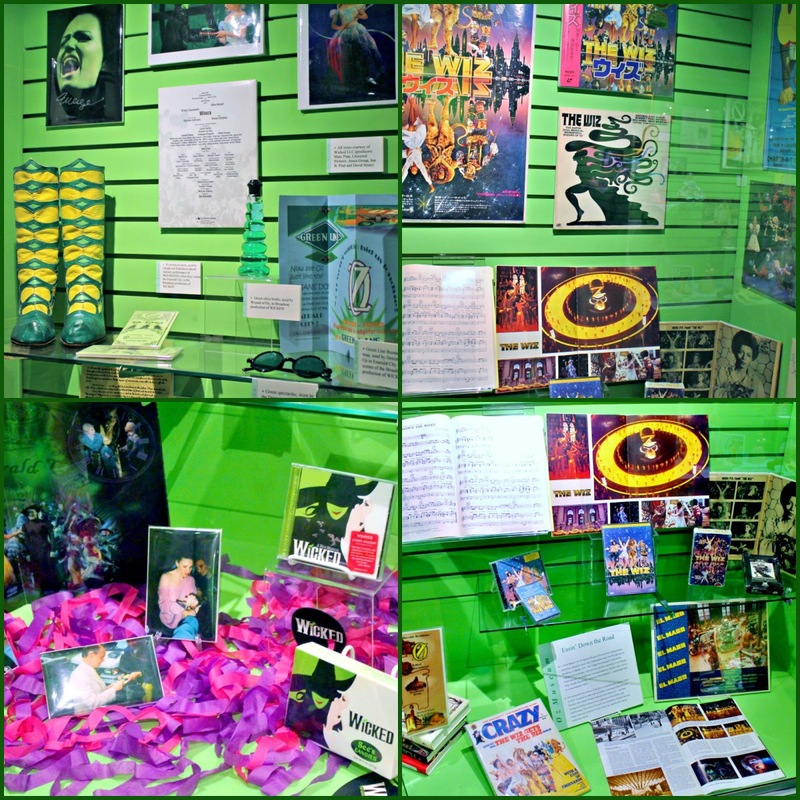 books, posters, busts, and snow globes. Of course, the 1939 film was not the first Oz movie. The first film version was made in 1910! Baum himself formed The Oz Film Manufacturing Company, which operated in 1914-1915. (You can see some films on YouTube: here, here, and here.) The 1925 film version, which bears little resemblance to anything in the Baum books, is best known today for featuring Oliver Hardy as the Tin Man, prior to his pairing with Stan Laurel. Big Sis stops to watch a bit of an early Oz silent. Judy Garland memorabilia. "Mom, look! 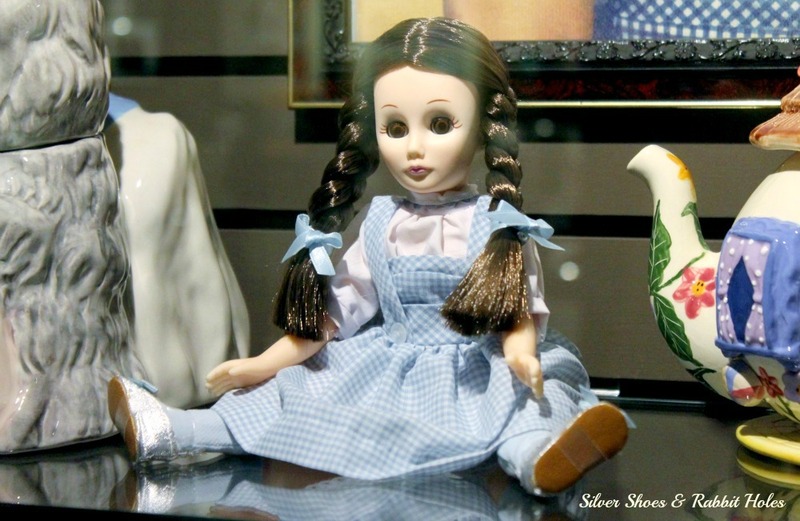 This Dorothy has silver slippers! Like the book!" 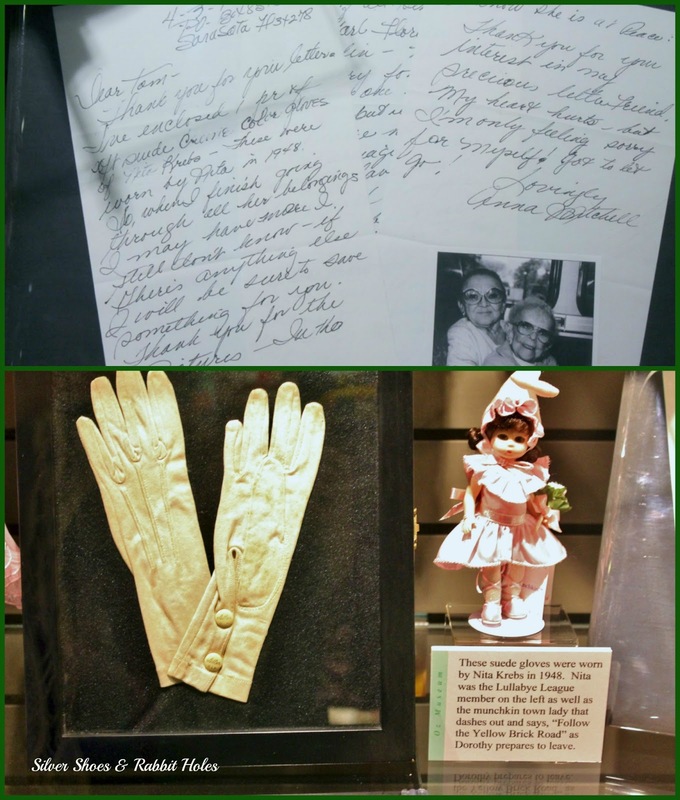 These gloves were worn in 1948 by Nita Krebs, one of the Lullabye League Munchkins. 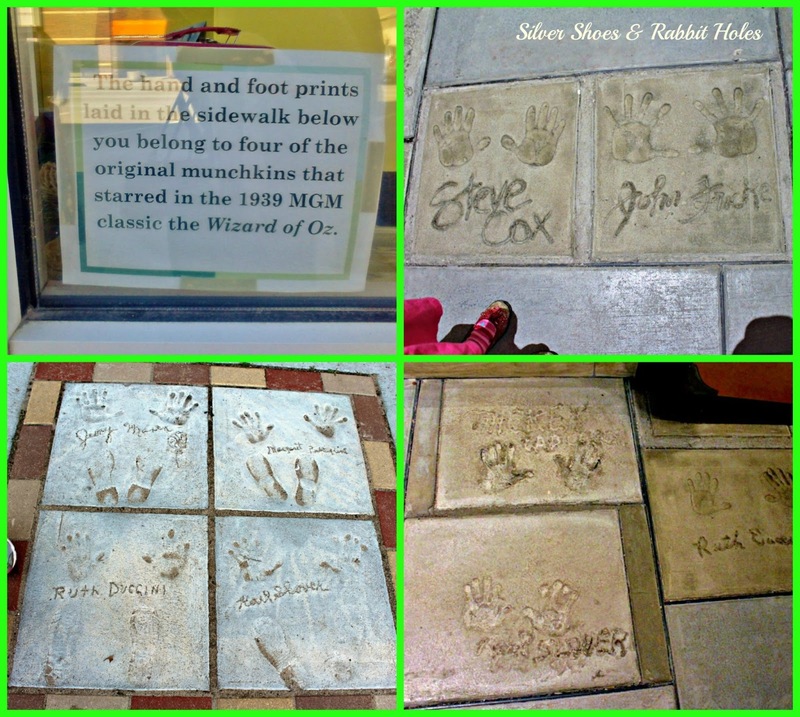 and outside The OZ Museum. Of course, there is a screening room, where you can sit and watch the movie for a while. and a documentary about the movie. The 1939 film was not the last Oz-related adaptation, either. 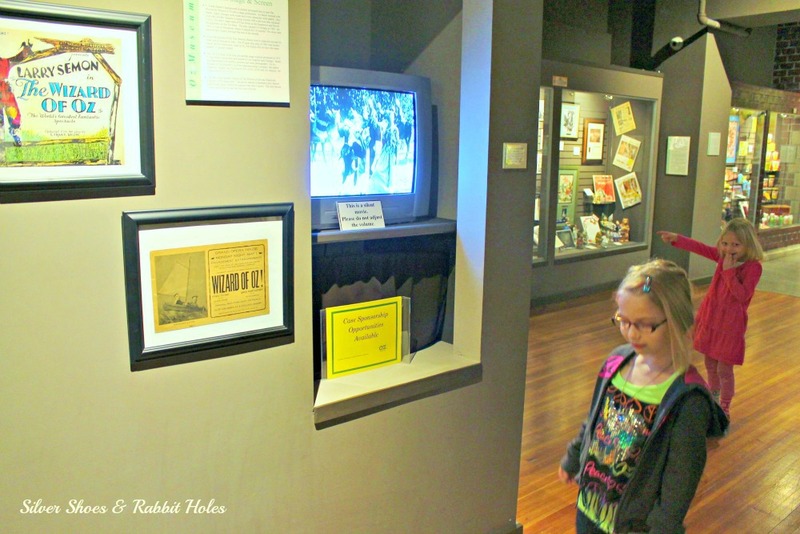 The museum devotes a little space to those, too. as his wife, Maud, and Rue McClanahan as Maud's feminist mother-in-law, Matilda Joslyn Gage. 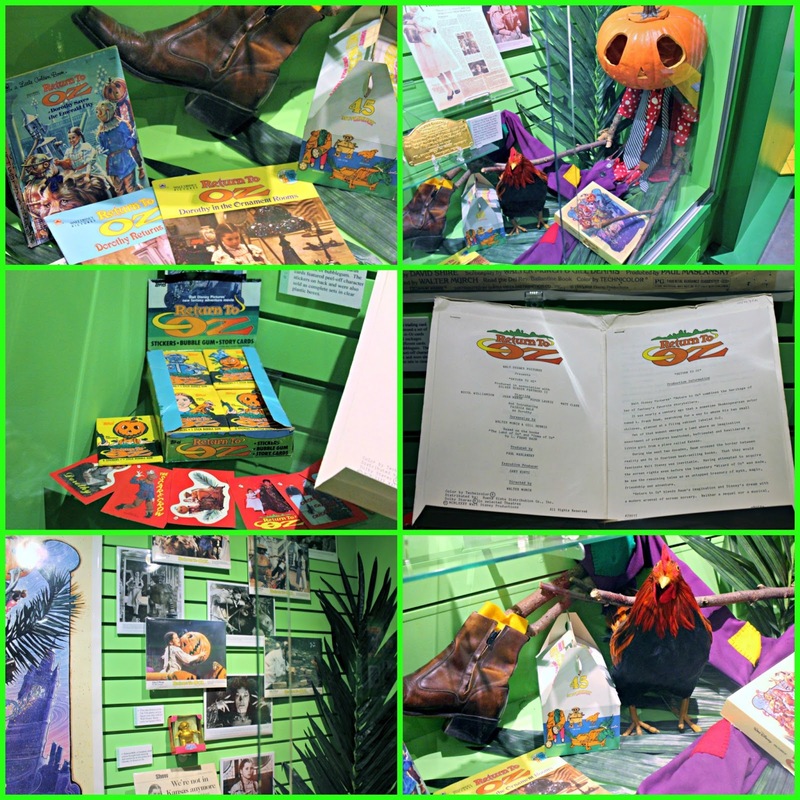 "The Dreamer of Oz" stuff shared space with memorabilia from "The Muppets' Wizard of Oz" (ABC, 2005). 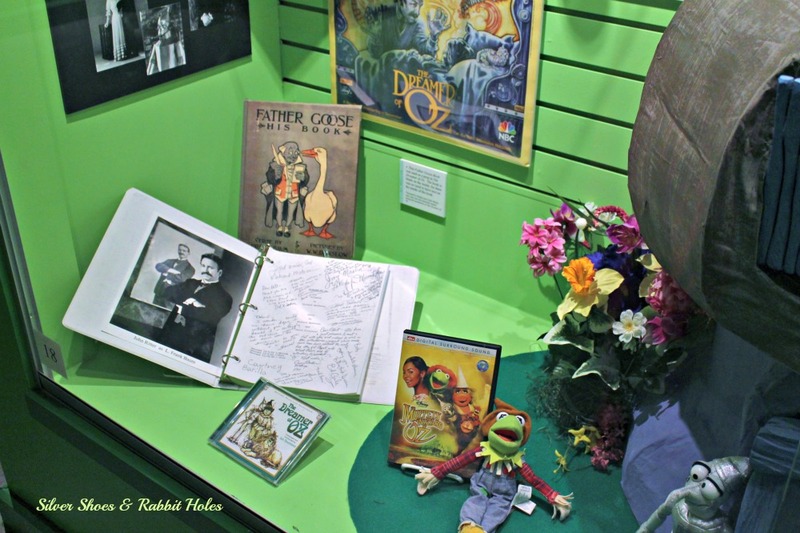 One of the girls' favorite cases was devoted entirely to the 1985 Disney theatrical release Return to Oz, starring a very young Fairuza Balk as Dorothy. I still remember seeing this one in a movie theater in Oklahoma on a family trip. My sister and I liked to play "Princess Mombie" with our Barbies. We'd pull the heads off a bunch of dolls, put them on a Barbie boutique shopping rack, and have one doll change her head. My sister loaned the movie to the girls when Little Sis was still very small, around the time Big Sis and I were still reading the Baum books. It took Little Sis a very long time to give the 1939 film a try. She loved Return to Oz. She does love her dark and creepy stuff, and this movie is pretty dark and creepy. 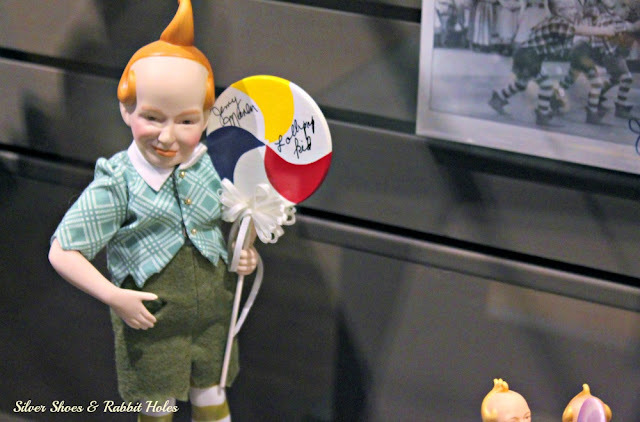 Plus, she liked the fact that Dorothy really was a little girl, as opposed to a teenager. We actually own that yellow paperback, Return to Oz: Dorothy in the Ornament Rooms. 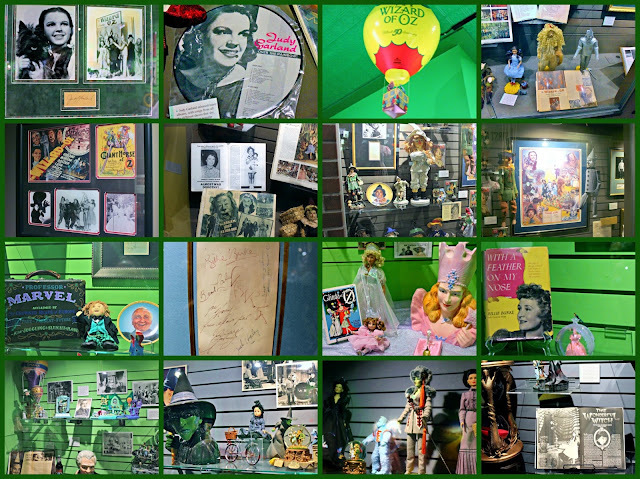 Not pictured: a ton of new official merchandise in the gift shop pertaining to Disney's Oz The Great and Powerful. No, I haven't seen it yet. I'm still debating whether or not I want to. I'm picky like that. Part Three is right here. And if you missed Part One, here you go. 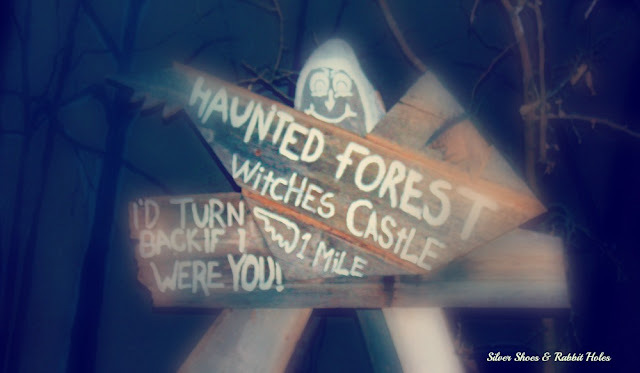 WHAT COOL PLACE! So...I saw the new movie. I think it's worth seeing. But it's not great. But still worth seeing. I thought all the way to the end that I would take Julia at another time, but the ending it just a little too intense for her. I can't do 3D ~ makes me feel sick for HOURS. Andrew came with me and we saw it on a regular screen. We might do it. I may be cheap and wait until it hits the cheap theater, though. Our local drive-in is already open, and it was showing it last week, but we've had too much going on to try it. Amazing! Thanks for all your blog posts these days - you have been a busy girl!! I, on the other hand, am woefully overdue for a post. I might be overdoing it, but I've had spring break to spend time with the girls and actually have material! April is going to be crazy, and my posts will probably be back to short M-F items. "Um... here's a picture. Enjoy." So glad that you didn't wait until May to share this!! Loving those Oz trolls, they are too funny:) Can't imagine Oliver Hardy as the Tin Man, though. Somehow that just doesn't seem to want to work in my mind. Big Sis is still a little miffed that Little Sis got her troll photo, but she didn't get her Hello Kitty photo. (I wasn't checking to make sure every picture turned out, I was concentrating on all the stuff!) The entire 1925 film is pretty funny if you've ever read an Oz book, because it's clear they took the characters and made their own movie with their own storyline. It has nothing to do with Baum, other than crediting his son with the scenario. It's questionable that he actually wrote that scenario, too. 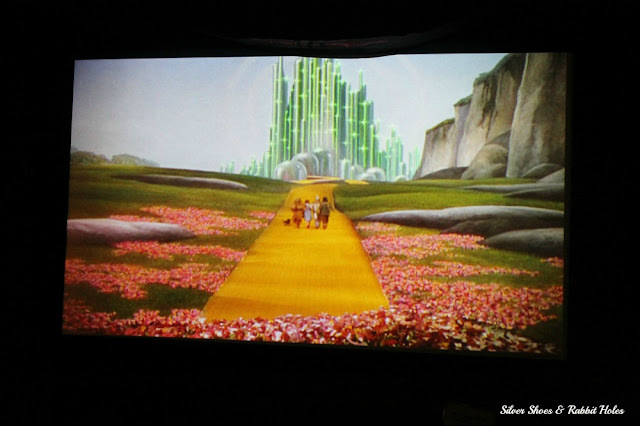 The older Oz films are more interesting, although as a silent film fan, I do think they're difficult to sit through. They aren't the best made films of their time. It's well with a trip. We hope to visit again soon.